WordPress search doesn’t search everything, and doesn’t give you enough control over what is searched and how. Relevanssi gives you full access and full control, with plenty of filters and ways to make Relevanssi work the way you want your search to work. PDF contents Relevanssi can read the text from your PDFs, index it and search it! Read more about indexing PDFs. Multisite searches Relevanssi can run searches across many subsites in the same multisite network. Custom fields Relevanssi will find the content in your custom fields, including things like WooCommerce SKUs, ACF field content or whatever it is you store in custom fields. Read more about custom field search. User profiles Yes, Relevanssi will find users by their names and profile descriptions. Taxonomy terms No matter if you prefer categories, tags or custom taxonomies, Relevanssi will return the term archive pages in searches! Shortcode output Relevanssi can expand shortcodes and find content generated by shortcodes. Search Relevanssi.com – using Relevanssi, of course! I’ve used Relevanssi for several years now, and it is an essential plugin on my bigger sites. 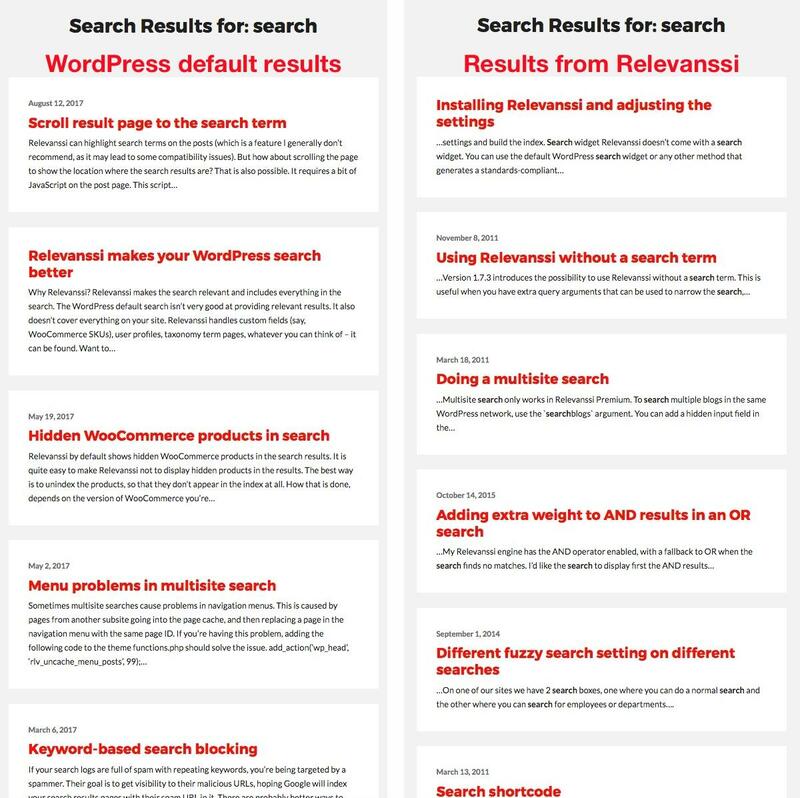 Relevanssi is an absolute must-have if you want to offer a better user experience on your WordPress website, because we all know how important a good search function is (and how bad the standard WordPress search is). Mikko keeps adding new features – I love the PDF search and more recently the related posts feature. Support is excellent, even for help with non-standard features. Thanks Mikko! I am two years new to the website business. I have, however, been a graphic designer for nearly 40 years. I purchased Relevanssi after reading so many positive reviews. I had some issues getting Relevanssi installed — not because of product, but because of where I am in the learning curve.  I contacted Mikko and he got me all set up, including fixing some other issues I had created in Google, which were sure to cause problems with Relevanssi. I can’t say enough positive things about Mikko. He responded to all my questions immediately, and I mean immediately. He never snarked, was always positive, and never made me feel like I don’t know what I’m doing — which I often don’t! Mikko and his product are top-shelf. The last search plugin I used displayed way, way too many results. I was afraid all the search results would be overwhelming to the user. I like the way Relevanssi displays and allows you to narrow down results as you want. It’s seldom one gets such prompt and helpful service – much appreciated! Relevanssi comes in two flavours. Free version of Relevanssi is available from WordPress Plugin Repository. It does the job and has over 1,600,000 downloads and more than 100,000 active installations and many satisfied users. For those who want something better, there's Relevanssi Premium, which you can buy here. So why go Premium, when the free version is available? Guaranteed support. Free version users get support if I have enough time available. Additional features. Relevanssi is developed actively and new features are added. Free version users won't get the new features, or get them long after Premium users have enjoyed them. Future development. More users for Relevanssi Premium means I can spend more time developing the plugin. See Relevanssi Premium prices and buy yours here! Annual is valid for a year and provides access to upgrades and support. Once a year has passed, the plugin will still work, but you won’t get access to upgrades, support or attachment indexing services, until you renew the license. Permanent gives you lifetime access to upgrades and support. Both licenses let you use Relevanssi on unlimited number of sites, Relevanssi use is not restricted to a limited number of sites. The annual license include support and upgrades for a year. It is not a subscription: once a year has passed, the license expires and you need to renew if you want it to continue, but you will not be billed automatically. Relevanssi is a great plugin, but it can't cover all specialized needs. It can be adapted to many demands with custom modifications, though, so just contact me and we can build you the custom search plugin you need, based on the awesome power of Relevanssi. On the left, regular random results from WordPress default search. On the right, relevant results from Relevanssi, with the search terms highlighted.